President Trump continued to vent his frustration over immigration on Twitter. On Monday morning, President Donald Trump continued the Twitter tirade about immigration, the border, and Congress that he began on Easter Sunday. In a series of tweets, Trump said "DACA is dead," blamed Mexico for immigrants illegally crossing the U.S.- Mexico border, and called on Congress to pass border legislation by invoking the "nuclear option," a change in rules both House Speaker Paul Ryan and Senate Majority Leader Mitch McConnell have rejected. He also tweeted about Amazon, CNN, Sinclair Broadcasting, and the Justice Department – all before heading out to mingle with families on the White House South Lawn at the annual Easter Egg Roll. "Mexico has the absolute power not to let these large “Caravans” of people enter their country. They must stop them at their Northern Border, which they can do because their border laws work, not allow them to pass through into our country, which has no effective border laws," Trump tweeted. "Congress must immediately pass Border Legislation, use Nuclear Option if necessary, to stop the massive inflow of Drugs and People. Border Patrol Agents (and ICE) are GREAT, but the weak Dem laws don’t allow them to do their job. Act now Congress, our country is being stolen!" He continued. "DACA is dead because the Democrats didn’t care or act, and now everyone wants to get onto the DACA bandwagon," Trump tweeted. "No longer works. Must build Wall and secure our borders with proper Border legislation. Democrats want No Borders, hence drugs and crime!" The president ended the Deferred Action for Childhood Arrivals program last September and gave Congress a deadline of March 5 to pass legislation to protect the nearly 700,000 young people with DACA status, so-called Dreamers. The deadline passed, and Congress has failed to find a solution. Currently, the program is not accepting any additional applications. Trump then tied the North American Free Trade Agreement, currently being re-negotiated by the United States, Mexico, and Canada, to Trump's campaign promise to build a border wall along the southern U.S. border. "Mexico is making a fortune on NAFTA...They have very strong border laws - ours are pathetic. With all of the money they make from the U.S., hopefully they will stop people from coming through their country and into ours, at least until Congress changes our immigration laws!" Trump's first tweet on Monday appeared to be responding to a news report on Fox News about a "caravan" of Central American migrants traveling to the United States with an organization called "Pueblos Sin Frontiers." But the caravan has nothing to do with DACA – the roughly 1,200 people marching mostly from Honduras are seeking political asylum. 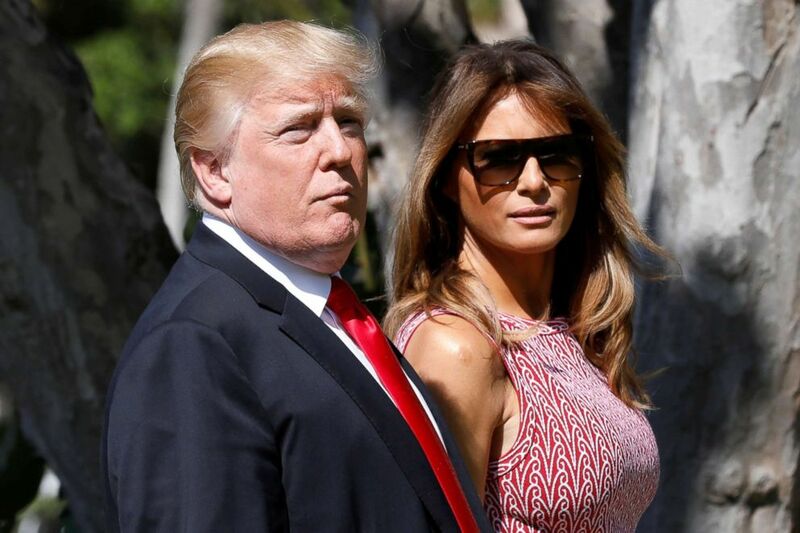 (Yuri Gripas/Reuters) President Donald Trump and first lady Melania Trump arrive for the Easter service at Bethesda-by-the-Sea Episcopal Church in Palm Beach, Florida, April 1, 2018. The president began expressing his frustration with DACA over the weekend at his private Mar-a-Lago club in Palm Beach, Fla. Before entering church at Bethesda-By-The-Sea with first lady Melania Trump and his daughter Tiffany, Trump stopped to answer a reporter's question about his tweet decrying "no DACA deal." Over the weekend, Trump spent time with immigration hardliners including his senior policy advisor Stephen Miller and Fox News host Sean Hannity. "A lot of people are coming in because they want to take advantage of DACA, and we're going to have to really see. They had a great chance. The Democrats blew it," Trump said before entering church. "They had a great, great chance but we'll have to take a look, because Mexico has got to help us at the border. They flow right through Mexico. They send them into the United States. It can't happen that way anymore." The president's position on DACA has frequently shifted. "I love the Dreamers. I do love the Dreamers," Trump said at the annual Gridiron Club Dinner in March. Trump included a pathway to citizenship for Dreamers in his "Four Pillars" plan for immigration reform. Now, despite promises to Dreamers to take action, he says "DACA is dead." Sen. Jeff Flake, R-Ariz., a political foe of the president but a member of Congress who has worked on bipartisan immigration reform tweeted Monday morning, "There are plenty of lawmakers on both sides of the aisle who stand ready to work with the administration on legislation to protect DACA kids who call America home. Let's do it." A few hours later in the morning, the president pivoted to the media, Amazon and the U.S. Postal Service, and the Justice Department in a series of tweets. "So funny to watch Fake News Networks, among the most dishonest groups of people I have ever dealt with, criticize Sinclair Broadcasting for being biased. Sinclair is far superior to CNN and even more Fake NBC, which is a total joke," tweeted the president about criticism over a message Sinclair Broadcast Group had local news anchors deliver to their regional audiences. Next, he was on to talk about Amazon and the Post Office, claiming that the Post Office loses "a fortune" with Amazon. "Also, our fully tax paying retailers are closing stores all over the country...not a level playing field!" Finally, the president tweeted about "unredacted documents requested by Congress," calling it "an embarrassment to our country!" Former deputy attorney general Sally Yates, who Trump fired at the beginning of his presidency, expressed disapproval of the president's tweet. "For 27 years, I was privileged to work with the thousands of career DOJ lawyers and FBI agents who work hard every day to keep our country safe, our rights protected, and the rule of law intact. They deserve better than this," she replied to Trump's tweet. While the president did not detail what documents he was referring to, only minutes before his tweet, Fox News aired a segment about opening up documents related to special counsel Robert Mueller's investigation into Russian meddling in the 2016 election.